By Miriam Valverde on Friday, January 18th, 2019 at 9:00 a.m. The United States is in its 28th day of a partial federal government shutdown over the funding of a border wall with Mexico. President Donald Trump is unwilling to sign a spending deal to re-open the government if it doesn’t include billions of dollars for a border wall, and Democrats in Congress aren’t willing to support a bill that provides the money. Senate Majority Leader Mitch McConnell, R-Ky., said he won't have the Senate vote on a proposal that doesn't have Trump's approval. Trump has floated the possibility of declaring a national emergency as a resort for building the border wall, to the chagrin of Democrats who say he's inventing a crisis. So far, Trump has not discarded that option. The move presents a number of questions, so we went searching for answers on it would mean for the shutdown, the border wall's construction, and the precedent for future presidents. Does a president have legal authority to declare a national emergency? Yes. A relevant law is the National Emergencies Act of 1976. The act itself did not give a legal definition for a national emergency, nor did it set specific criteria for declaring one. Rather, it created procedural requirements. It requires a president to formally submit to Congress and to the Federal Register a declaration of the national emergency; to specify the statutory authorities he or she is invoking; and to renew the declaration every year, or it will automatically expire. "Even though the Constitution itself grants the president very little in the way of emergency authority, Congress has ceded broad powers to the president that he can invoke merely by claiming that an emergency exists," said Gene Healy, a vice president at the Cato Institute, a libertarian think tank. Does declaring a national emergency automatically end a government shutdown? No. The end of the current shutdown depends on Congress and the president reaching an agreement to re-open government. Whether and how funding is allocated for Trump’s wall is a significant part of that, said Andrew Boyle, a counsel in the Liberty and National Security Program at the Brennan Center for Justice. "If the budget impasse were broken, then the shutdown would end," said Toni Massaro, a constitutional law professor and Milton O. Riepe Chair in Constitutional Law at the University of Arizona James E. Rogers College of Law. Under a national emergency declaration, is a president allowed to unilaterally divert funds (including obligated funds) from one agency/department to another to accomplish a policy goal? Congress has delegated broad powers allowing a president to repurpose funds after declaring a national emergency, but there are still laws to follow. Declaring a national emergency does not automatically get Trump $5.7 billion for a border wall. According to some media reports, the White House has asked the Army Corps of Engineers to examine if funds from its budget for civil work projects, including flood control projects in areas affected by recent natural disasters, could be used for the border wall. "He would have to try to use statutory powers previously given by Congress that purportedly allow him to reallocate money for that purpose," Boyle said. If Trump declared a national emergency, expert said he might rely on 10 U.S. Code Section 2808 and 33 U.S. Code Section 2293. In very broad terms, they concern the use of the armed forces to undertake military construction projects, and the termination or deferment of Army civil works project and using those resources to undertake other construction "essential to the national defense." "Even if the federal courts hear the matter, they may defer to the president's invocation of emergency power," Massaro said, noting the U.S. Supreme Court’s ruling in favor of the Trump administration in the travel ban case. "Courts are especially deferential when a president claims something is a matter of ‘national security.'" Would the military be barred from building the wall? Boyle, from the Brennan Center, is skeptical of claims that the Posse Comitatus Act prevents the military from building the border wall. The particular details of how the military is used could affect that debate. Military construction projects on their face are not a law enforcement activity, like policing, Boyle said. Also, the military has already been sent to the border to provide Customs and Border Protection logistical support and to help repair border fencing. Do presidents commonly declare national emergencies? National emergency declarations are used relatively frequently, Boyle said. A president can issue his or her own national emergency declaration and renew declarations from past presidents that have not expired, he said. A Brennan Center database says there’s been at least 58 national emergency declarations since November 1979; 31 are still in effect today. They often deal with situations related to foreign governments and foreign entities and rely on powers under the International Emergency Economic Powers Act. Events leading to national emergency declarations include the 2009 H1N1 influenza pandemic and the 9/11 terrorist attacks. The longest-running national emergency declaration is from 1979, first issued by Democratic President Jimmy Carter in the wake of the Iran hostage crisis. It froze Iranian government assets within U.S. jurisdictions. Trump renewed the declaration in November 2018. A new national emergency declaration from Nov. 27, 2018, blocks property of certain individuals contributing to human rights abuses in Nicaragua, who are undermining that country’s democratic processes or institutions, or are involved in related actions. Would declaring a national emergency to build a border wall be an unusual move? What kind of precedent does that set? Trump’s consideration strikes many as unusual, Massaro said, "because the evidence of a national emergency seems especially weak." The United States has grappled with its immigration flow for decades. "There is little to support claims of ‘gushing’ in between points of entry or that the gaps in the existing barriers are the source of any threats to national security," Massaro said by email. "Building a wall on the southern border may not solve the specific perils identified by the president; and the president's party had absolute control of the federal government for the past two years and did not authorize funds to build the wall." 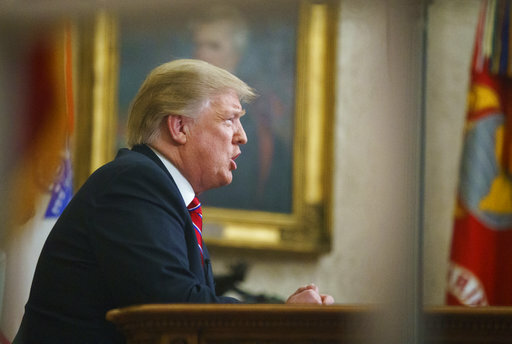 Trump said he would declare a national emergency if he can't get Congress to agree with him; experts say that would amount to using emergency powers to do an end-run around the legislative process. "If it ended up ‘working’ — a pretty substantial ‘if’— the resulting precedent would encourage more instances of rule-by-emergency-decree in future budget battles," the Cato Institute’s Healey said.